"If you're looking at this page this far ahead of publication, you're probably a member of Seth Godin's tribe. And if so, you already know what this book is about. You know about waiting in line at an Apple store, or the look on a fellow Deadhead's face. You know about the way it feels to go back to the church where you grew up. You know about the real power of a brand. According to Godin, Tribes are groups of people aligned around an idea, connected to a leader and to each other. Tribes make our world work, and always have. The new opportunity is that it's easier than ever to find, organize, and lead a tribe. The Web has enabled an explosion of all kinds of tribes -- and created shortage of people to lead them. This is the growth industry of our time. Tribes (the book) will help you understand exactly what's at stake, and why YOU can and should lead a tribe of your own." As Robin Williams says at the end of Good Will Hunting: "He stole my line." Time to finish my book on theatre tribes! 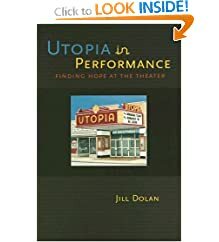 In my Theatre of the Oppressed class this semester, we are reading Jill Dolan's Utopia in Performance: Finding Hope at the Theatre. Now at Princeton, Dr. Dolan (who headed the Theatre Department at City University of New York Graduate Center when I was completing my doctorate) wrote her book while at the University of Texas at Austin. I have previously linked to her fantastic blog post "Unhappy Thespians: A Manifesto on Training Theatre Students" on her Feminist Spectator blog. I could offer quoatation after quotation of stuff that makes me stand up and shout, but I will confine myself to a paragraph from Chapter 2. I would draw your attention to the sense of abundance in this paragraph: she doesn't call for her vision to replace the more mainstream vision, but to supplement it, to be considered as an alternative, an alternative that has just as much excitement and value as the one that has been single-mindedly promoted over the past century. It is a vision that is generous. And yet I know from experience as a professor that this is a tough idea to sell to young people. The dominant paradigm, which is focused on individualism and materialism rather than communalism and idealism, is so strong that young people see the dismal employment figures of traditional theatre production as something that whets their appetite, as the pre-condition for an inspiring jump from obscurity to fame. Along the way, actors are encouraged to become blank slates for the marketplace to write on, to erase their own sense of ideals, indeed their own sense of identity, in order to be more "employable." And college professors, who themselves often had the same goals and same paradigm, discourage actors from thinking, from developing their own sense of purpose and aesthetics, their own sense of what they have to contribute. This often surfaces in the enormous hostility I hear expressed towards academia, and rightfully so: it is the place where actors had their individuality erased, where they were beaten down and taunted and diminished as part of a "reshaping" process that is called "training." From the moment they arrive at their first departmental audition, they enter a miniature version of the marketplace where the professors cast not according to how they might best learn, but rather according to how they might best be used to create a product. And so when they arrive in a class like Dolan's, or in my own, they revolt against the attempt to encourage them to think, to develop their own ideas, their own beliefs, and develop them as part of a rich conversation that has been ongoing for 2500 years -- because they know that it is a lie; that once they leave that particular classroom, they will once again be forced to erase themselves. Why go through the pain of developing as a unique individual when one must rejoin the masses again in order to survive, to be cast? I have sympathy for them, because they have been told that there are no alternatives, and those who have revolted against those limited opportunities by college have self-selected themselves into other departments, other field of endeavor. "Believing that the best training for a career in the theater is a broad-based liberal arts education, Princeton does not have a concentration in Theater. Instead, we offer a certificate in Theater and encourage students, should they have the inclination, to make connections in their artistic work between their fields of concentration and their love of the theater. The program offers the kinds of courses and co-curricular activities that will allow the student, upon graduation, to move into the best graduate conservatories to pursue advanced training in playwriting, acting, directing, design, stage management, and dramaturgy. But most students who take courses in the program do not elect to enter the certificate program; they simply enroll in the courses that interest them. Students with a particular interest in and commitment to the arts, however, may want to obtain the program certificate." This represents quite a change from the UT Austin approach, perhaps one more suited to someone with Dolan's performance studies orientation. If I knew a young person who was interested in the theatre, and who I wanted to encourage as an artist, I would be more likely to point him or her to Princeton, where his or her individuality might be enriched rather than erased.